It is with great sadness that we learnt of Tessa Jowell’s death. Tessa was Professor in Practice at LSE Cities and the Department of Government and contributed with energy and passion to our programmes. She was most recently at the School in December 2017, reflecting with master’s students on the importance of leadership. Apart from her commitment to public life, Tessa recognised how critical it is to work with young people to improve their life chances, everywhere from young women in India to school-kids in deprived areas of south London. We will miss her enthusiasm, commitment and belief in public service. 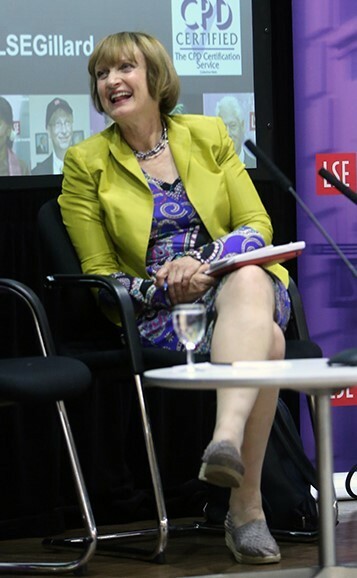 Tessa Jowell had been a leading figure in London government since the early 1970s, when she first became a Labour member of Camden Council (in 1971) before going on to chair the authority’s social services committee from 1973. In the late 1970s, she stood for Parliament in Ilford North before being elected MP for Dulwich (subsequently Dulwich and West Norwood) from 1992 to 2015. She was also a leading contender for the Labour nomination to be Mayor of London in 2015. In Parliament, Tessa was involved in select committees before Labour took office in 1997. Thereafter she held a series of ministerial posts, culminating in her appointment as Secretary of State for Culture, Media and Sport and then Olympics minister. London 2012 might never have happened were it not for Tessa Jowell’s empowering optimism, working alongside mayors Ken Livingstone and Boris Johnson. I was a member of the Lambeth and Southwark Childcare Commission she chaired in 2014-15. The committee typically held its meetings in children’s centres and community centres, reflecting Tessa’s desire to talk to those most closely affected by local services for children. Her experience at the neighbourhood level, in Parliament and in the internationally-focused effort to win the Olympics was remarkable. During the last year, she used her position in the House of Lords to make the case for access to innovative treatments for cancer. Downing Street has announced that funding for brain cancer research will be doubled as a response to Tessa Jowell’s final campaign. Tessa was simultaneously delicate and powerful, empathetic yet determined. In an era of aggressive political discourse, she remained enthusiastic to work across party lines to achieve outcomes which would improve the lives of people, particularly children, rendered powerless by the complex machinery of government. My condolence to Prof. Dame Tessa Jowell’s family and friends. We will surely miss her at a time the impending crisis is increasing affecting young people the most.